* Upper comes in silver zinc finish Quality Construction: Uppers - Chrome Moly Formed boxes that have been revised with a gusset to eliminate any flex or unwanted distortion from Ultra High Horsepower cars. We have also had additional Top and bottom Plate reinforcements that will now outlast even the strongest 7second 200MPH Drag Radial and Outlaw cars making in excess of 2500+HP. 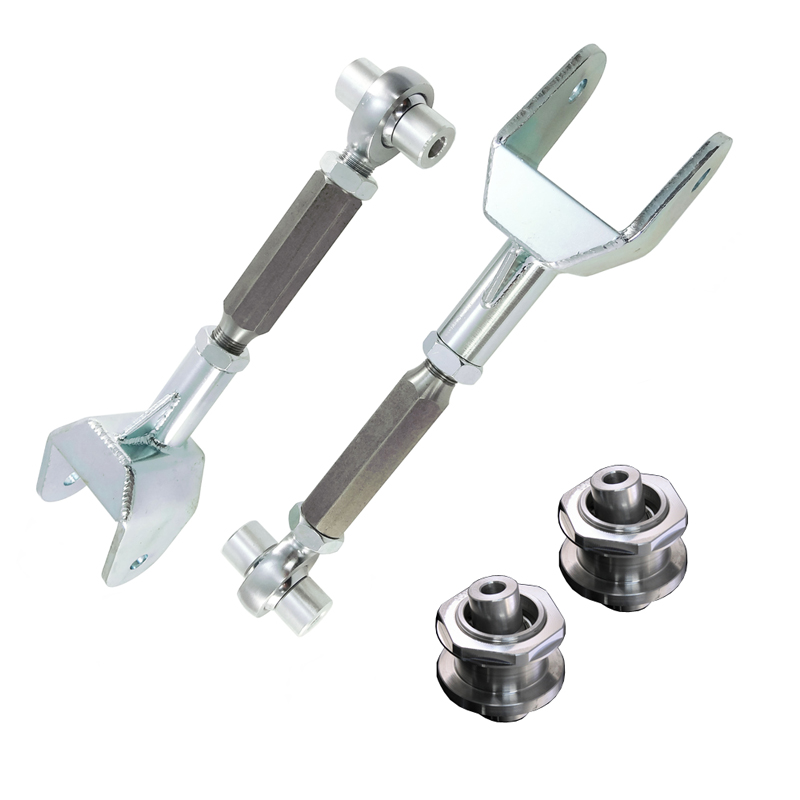 The 4130 Chrome Moly threaded adjuster system allows these bars to be fully in car adjustable on the fly or between rounds in the lanes. Setting your pinion angle just got so much easier that it can be done in just minutes. Hands down these are the Strongest Double Adjustable Uppers available in the industry. Fully CNC machined and tig welded in billet steel fixtures to ensure perfection. Our Silver Zinc Plating will withstand the Elements & Resistant Corrosion. Last but not least is our 7075 billet aluminum bushings and high strength performance alloy Sphericals - Our spherical bushings are made of super strong 7075 Billet Aluminum, Teflon lined Com bearing for maximum part life. These bushings will let your rear upper control arms and rear end move smoother and faster for more traction every time. Easy Install: Installs in 2.5 hours. Fits these Vehicles: 1978 1979 1980 1981 1982 1983 1984 1985 1986 1987 1988 Buick Regal Grand National GNX Chevrolet Monte Carlo El Camino Malibu Caballero Oldsmobile Cutlass Pontiac Grand Price Grand LeMans Bonneville.